Place washed grapes and place on a shallow baking pan, drizzle with a small amount of olive oil. Roast for 30 minutes. During the last 10 to 15 minutes grapes are roasting, slice bread and brush with olive oil. Place on another shallow baking pan and toast in the oven just until the bread starts to brown. Remove from oven, slice burrata and place on toast. Return toast to the oven and heat until cheese just starts to melt. 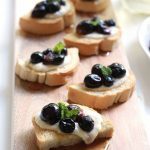 Remove grapes from the vine, place on toast and drizzle with agave or honey.